I mentioned this in another thread, that Watch Dogs 2 has an option it calls Temporal Filtering which is basically an Ubisoft version of checkerboarding mixed with some AA, and it works extremely well in that game. I know personally I could not tell the difference visually, only that my FPS was a lot higher. Given how good the implimentation worked in that game, I woudn't be surprised if Ubisoft is now using it by default to some extent in some if the newer titles, because I don't know why they wouldn't at least have it as an option in newer games unless they believe their implimentation of it is so good that it should be used all the time now. If that is the case, I would say they're logic isn't wrong at all. If you can only tell their games are using upscaling by doing an indepth frame comparison then why not use it all the time? Side note, It would have been great if they had that feature for Wildlands when that games released because that game basically looks just as good as some of their newer titles but it's still a very demanding game on any PC, and when it released I think a lot of people avoided it because of how demanding it was. He isn't wrong that entire shebang about DLSS, from the onset, was quoted to work through GFE and the details came from the horses mouth. Unless you have source who had confirmed to you while at launch of the RTX series that GFE wouldn't be a pre-requisite for DLSS while the media ran with the article claiming the contrary. tried into/work through GFE does NOT mean exclusive to GFE. the confirmation is the drivers themselves; despite the echo chamber of the internet. Last edited by Hwgeek; 02-15-2019 at 02:37 AM. Those Tensor cores are there for creative developers not just DLSS. They finally have the hardware they just have to put it to use. Mighty fine beta testing cards the RTX cards are yes. DLSS is in its infancy. Right now it will continue to be restricted to nVidia as a check point to generate revenue and also help with quality control as it is developed. This tech will eventually bleed out into the general market availability for developers, likely with purchasable learning systems. As this system evolves the quality of image upscaling will also increase. The biggest draw to consumers of using DLSS will be to extend the life of compatible parts as games become far more advanced. At its core DLSS is a tech that is here to stay, how AMD will answer this is unknown. 8K Resolution will be devastating to the hardware we have at hand with current limitations in technology for gaming as it gradually moves in the future to towards the mainstream market. 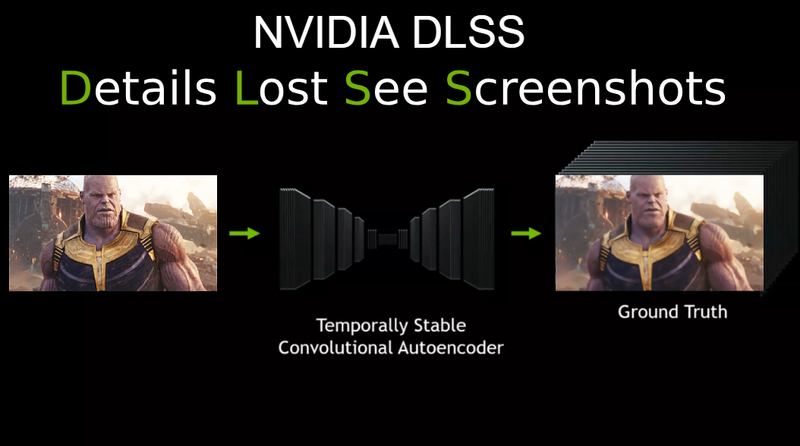 This is an issue that nVidia is trying to jump ahead of by creating/using DLSS. The RTX cards out today are literally only there to get the technology out into the wild, they are not end all solutions to this tech and will never be. Generation to generation of hardware releases there have been technological improvements and instruction sets released well prior to its adoption. This is no different in that theme out side of the fact this is a fundamental physical change to the GPU vs more being scaled into a soft variant. The reasons stated above are also the same reasons generating the tech hate we are seeing piggy back off of a poor release plan. Be patient and wait it out if you wish to not upgrade, that's fine. But in all honesty, the hate out there is mostly a crap load of people just trying to justify why they wont upgrade components. It is fine if you spent $900 on a inflated priced 1080TI last generation at its peak, you don't need to spend money on a costlier 2080TI, but don't go trying to justify it with hate based on misinformation. People keep hating on the price of entry for the RTX series, this is understandable as it did scale up. But the consumer also needs to know that the price to manufacture also scaled up. nVidia, like AMD, and Intel etc is not a charity. They do not make these products out of the kindness of their hearts to sell at cost. While I am no fan of nVidia myself as a business, I do own an RTX card in full disclosure and this is not an attempt to validate the purchase. Honestly, this is no different than the hate AMD seen for targeting the budget markets while developing the new Ryzen chips to be competitive again.